Cohn Resigns After Confrontation With Trump, His Replacement Will Be Chosen "Wisely"
The two frontrunners, now confirmed by administration officials, are White House Trade Council Advisor Peter 'Death By China' Navarro (seemingly the out of nowhere architect of Trump's trade war plan) and Conservative commentator Larry 'mothers milk of stocks' Kudlow (who was on CNBC today defending Cohn and talking down Trump's trade war plan). As we detailed earlier, tThe great power shift we predicted one week ago, was just confirmed by the NYT which reported that Gary Cohn, former Goldman president and COO and President Trump’s top economic adviser, is resigning, "the latest in a series of high-profile departures from the Trump administration, White House officials said on Tuesday." President Trump has confirmed Cohn's departure: "Gary has been my chief economic advisor and did a superb job in driving our agenda, helping to deliver historic tax cuts and reforms and unleashing the American economy once again. He is a rare talent, and I thank him for his dedicated service to the American people." Cohn also issued a statement: “It has been an honor to serve my country and enact pro-growth economic policies...I am grateful to the president for giving me this opportunity and wish him and the administration great success in the future." According to the NYT, officials insisted "there was no single factor behind the departure of Mr. Cohn" but his decision to leave came after he seemed poised to lose an internal struggle amid a Wild West-style process over Mr. Trump’s plan to impose large tariffs on steel and aluminum imports. 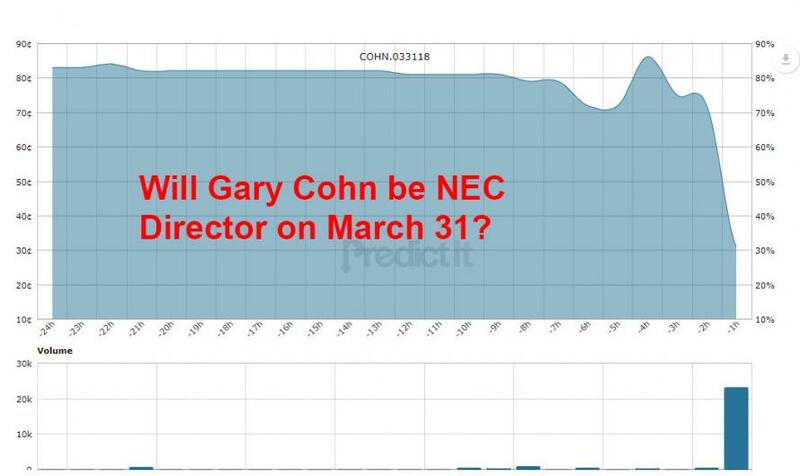 Yet one which few predicted: as recently as 2 hours ago, the "will Cohn have a job on March 31" contract was trading at 80 cents: "Will Gary Cohn be Director of the National Economic Council on March 31?" White House officials told me this afternoon that IF Gary Cohn leaves it won’t only be because of the tariff decision. They were clearly laying the groundwork for this news. 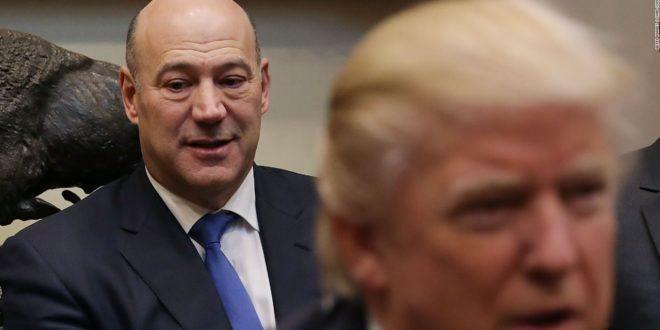 Cohn's former boss and current Goldman CEO, Blankfein said that he was disappointed to see Cohn leave: "Gary Cohn deserves credit for serving his country in a first class way. I’m sure I join many others who are disappointed to see him leave." Cohn is expected to leave in the coming weeks. He will join a string of recent departures by senior White House officials, including Trump’s communications director and a powerful staff secretary. Also note that Trump is not stopping with Cohn: according to the NYT, "The resignation also followed conversations Mr. Cohn held with the president in recent weeks about the possibility of replacing John F. Kelly as White House chief of staff, said people who were briefed on the matter. The president never formally offered Mr. Cohn the job, those people insisted, but Mr. Trump had discussions with him about whether he would be interested." So who will replace Cohn? According to Citi, "Larry Kudlow, Jason Miller and David Urban are said to be on the shortlist." It is likely that Cohn will still be allowed to keep the $284 million in tax-free proceeds he unlocked by leaving Goldman and joining the Trump admin for just over a year. 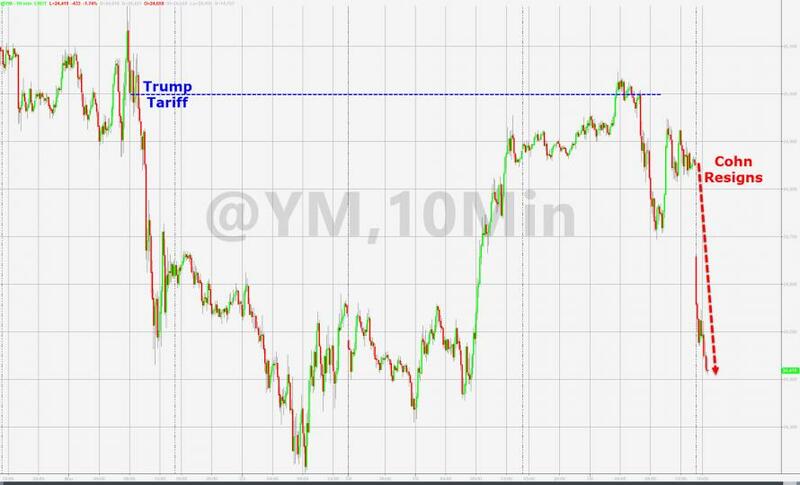 One thing that is certain is that Cohn's departure confirms that a worldwide trade war is about to break out, and is a good enough reason to reread the following article from this morning: "What If Trump Does Not Back Down, And Why Is "$1 Trillion" Being Floated Around Washington?" Confirming that, Axios reports that Trump has canceled the Thursday tariff meeting that Cohn had arranged with various anti-tariff CEOs. 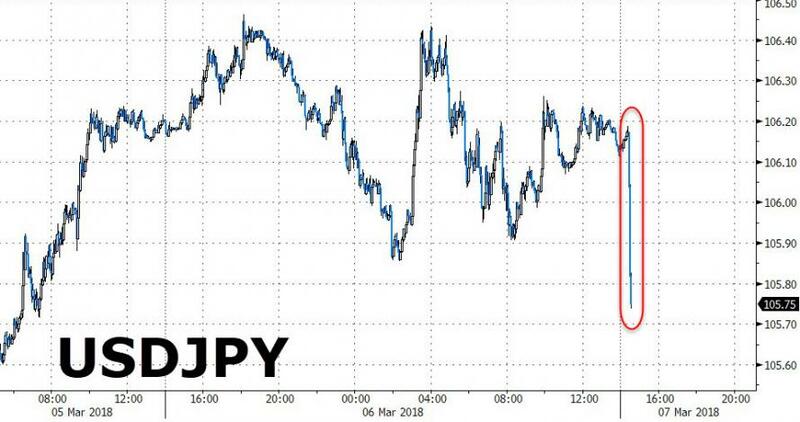 I kneejerk reaction, USDJPY and US equities have tumbled following news of the Cohn resignation.